I have recently decided to start dedicating myself to eating better and working out more. I had a baby 6 months ago and dang it if I wasn't going to be back in shape before swimsuit season hit. I posted this picture on Instagram and Facebook today and got a very quick response so I thought since I'm not doing Food Friday for a few more weeks, I would quick share this with you. By my calculations, this whole bowl was about 200-205 calories. I ate about half of it and was stuffed. It helps that a cup of squash is only about 40 calories!! 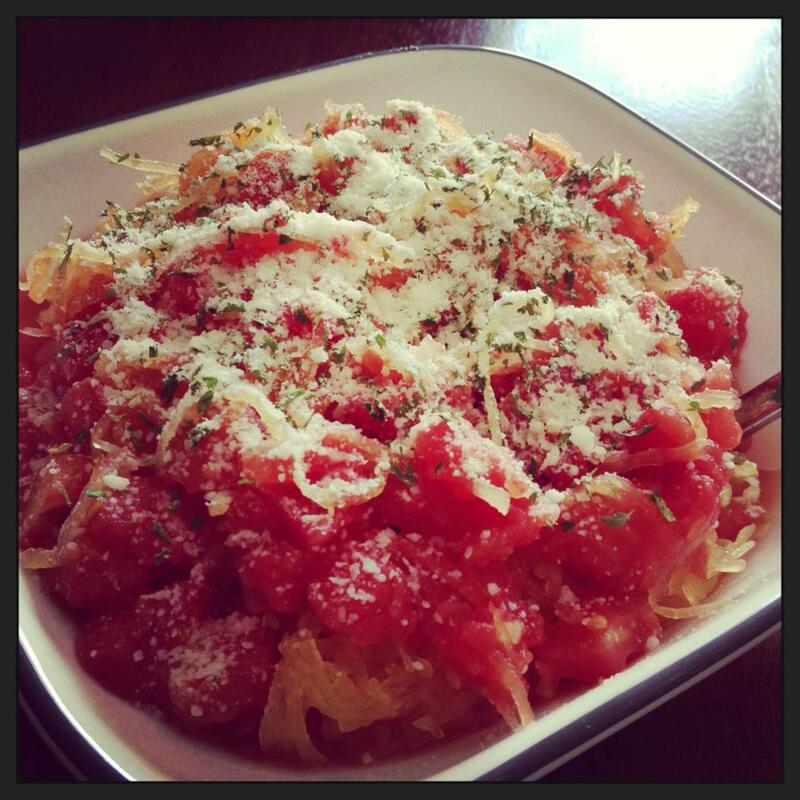 Now, let me preface this by saying: I have developed a serious love of spaghetti squash. I made it a few days ago with a homemade cauliflower puree wanna be alfredo sauce (recipe from my cousin Amanda) and it was to. die. for. Honestly, I didn't know what I was getting myself into when I bought it but it was awesome. This recipe today was created by yours truly because.. well... I didn't have the ingredients I wanted but I wanted spaghetti squash for lunch. I simply used what I had and it was awesome. Cook the spaghetti squash first since it takes the longest. You can bake it OR what I found to be easiest is microwaving it. I recommend about 7 minutes per pound. Be sure to poke holes all around it with a knife so it doesn't explode in the microwave!!! So my two pounder went in for 7 minutes, I rolled it, and it went in for 7 more minutes. Cut off the end with the stem, slice down the middle, and separate the halves. Scoop out the seeds and with a fork, scrape out the insides which essentially look like spaghetti. In a pan, heat up your tomatoes (canned or fresh... you'll want them warm). Toss in garlic and salt and give it a good stir. Add spaghetti squash to pan to heat to a matching temp, pour into a bowl, and sprinkle cheese and parsley on top. So delicious and SO good for you! !